Each week on Two Guys on Your Head, Dr. Art Markman and Dr. Bob Duke, explore different aspects of human behavior and the brain. In conversations hosted by producer Rebecca McInroy, the two renowned psychologists cover everything from the effects of sugar on the brain, to what's happening in our minds while we sleep, and much, much more. 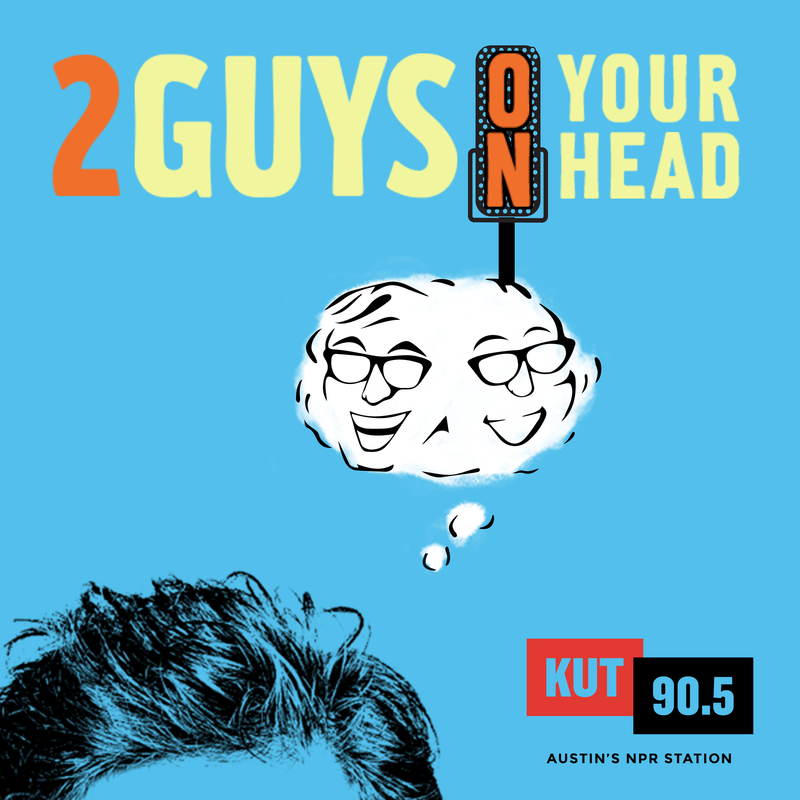 Listen to the Two Guys every Friday at 7:51 a.m., 1:49 and 4:51 p.m. on KUT-FM. You can always dig into the posts below or checkout and subscribe to podcasts via iTunes. Time flies when you're having fun, the old saying goes. But how can time – maybe the most fundamental concept of the universe – feel different under different conditions? Our brains perceive time differently in different circumstances. When we pay close attention to something, tedium can set in and it can feel like time slows to a crawl. Conversely, if our lives demand we juggle several different things at once, we tend to pay less attention to some activities – and time races by in a flash. Human beings are a social species. Our natural programming requires a certain amount of social contact with other people. Shared experiences are simply a fundamental component of our needs as humans. We don’t just have a need for direct interaction and verbal communication either – there's all sorts of nonverbal communicative actions we take in the presence of others that we wouldn’t do alone. In this installment of Two Guys on Your Head, Dr. Art Markman and Dr. Bob Duke take us through the psychological benefits of "going out" and mingling with our fellow humans. Writer’s block! That phrase might induce panic and a recollection of a familiar experience. It’s a very common phenomenon. So what is it? When in the beginning stages of undertaking a new writing project, a writer might find themselves blocked – stuck in front of a blank page or screen with no thoughts coming to mind. This lack of creative flow is further exacerbated by anxiety over the lack of production – making it a self-perpetuating cycle that can lead to stagnation. In this edition of Two Guys on Your Head, Dr. Art Markman and Dr. Bob Duke explain the ins and outs of how and why we sometimes get stuck – and what we can do to help ourselves in those difficult situations. “Hey, you’re smart!” That feels good to hear, doesn’t it? Praise always feels good, but not all praise motivates us to try new things, challenge ourselves, or deal with failure. In this episode of Two Guys on Your Head, Dr. Art Markman and Dr. Bob Duke discuss how to praise in a productive and meaningful way. In summary, when giving or receiving praise, it’s a helpful skill to think about where that praise is directed. When it comes to the Myers-Briggs personality type test, are you an introvert or an extrovert? Do you focus on sensing, or do you use your intuition to interpret information that you absorb? Does it matter? Why is it so entertaining and satisfying for some people to answer these questions about themselves and others in their lives? Listen to the show and let the Two Guys, Dr. Art Markman and Dr. Bob Duke, demystify the wiry world of personality tests for you. What's Going On Inside the Adolescent Brain? There’s endless questions we could ask about how the brain works. A particularly interesting one: what's unique about the brain during adolescence? During adolescence our brains are wired differently than adult brains will be – and for good reason. In adolescence our brains are in a process of development – so we’re less inhibited, allowing us to take the risks we need to learn about the world. In addition, the difference in brain physiology has other ramifications on behavior and needs. Ignoring them can make life more difficult for kids and parents. Are you an auditory learner or a visual learner? If you answered "yes" you would be right. That's because we use all our senses to learn and process information. In this edition of Two Guys On Your Head, Dr. Art Markman and Dr. Bob Duke dispel the myths behind learning styles preferences: they don’t really exist. Our reliance on the theories of learning styles to explain our success or failure of understanding certain information is actually serving our human need to put things into categories – combined with our need to explain things when they don’t work. I Think I'm Thinking, Therefore I Am? As human beings, we are, in fact, creatures. Like any other living organism, energy conservation is of highest priority to our vibrant being, whether we are consciously aware of that fact and its influence over our behavior or not. So, how does that affect our decisions in life? In this edition of Two Guys on Your Head, Dr. Art Markman and Dr. Bob Duke discuss two great minds in psychology, and the founders of Behavioral Economics, Daniel Kahneman and Amos Tversky. Why is it hard to have just one of those delicious slices of pound cake over the holidays? Well, it turns out it has less to do with the creamy butter and more to do with the way our brains react to those sweet white grains of sugar. In this edition of Two Guys on Your Head, Dr. Art Markman and Dr. Bob Duke discuss the ways our brains respond to sugar by releasing dopamine. While we may think this dopamine is supposed to make us feel good, what the chemicals in our brains are trying to do is to teach us that this sugar is a good thing and that we want more of it for our survival. This might have been beneficial to us 150,000 years ago, but with sweets in every candy dish, gas station and coffee shop, craving sugar has its consequences. It’s that time of the year when we resolve to drink less, exercise more, save money, etc. It may feel really good to intend to do “better” in the new year, but as Dr. Art Markman and Dr. Bob Duke explain in this edition of Two Guys on Your Head, real change takes planning and hard work. Why is that? It turns out we have no idea why we do most of the things we do on a daily basis. And as long as our behaviors are driven by factors that operate below our conscious awareness, we may not know how to change. As the Two Guys point out, effective change can happen when we start from the outside in. When we look at our environments first we can make space and cultivate relationships that help us become best selves. When it comes to what humans find attractive, many factors play a role. Evolutionarily speaking, we tend to be attracted to symmetry and markers that indicate health and wellness. In social terms it has more to do with what’s in fashion at a given moment. But it's when we begin to react to attractiveness that things get tricky. The part of our brains that is responsible for generating creativity evolved throughout human existence to serve a problem-solving function. If you lived in the great, wild, open world as a primitive human, and your problems were things like predators, or food security sources, or a need for shelter, what would your brain do? Your brain would concoct creative strategies to solve those problems, and that’s what our minds have built a capacity to do as we’ve evolved – create solutions. Drs. Art Markman and Bob Duke give you more of the details. Whether we like it or not, time marches on. And as it does, we age. One of the most challenging realities for everyone to face in life is that we are all, inevitably, destined to grow old (if we’re lucky, that is). Aging correlates to a steady decline of functional abilities, both physical and mental. Memory and cognition peak in our early twenties, and we begin a very slow, steady decline of those functions as we near our senior years. After age 80, many bodily functions – including brain function – seem to have reached the average limit of their operation. So what can we do to preserve our brains for as long as possible? Merriam-Webster defines delusion as “a belief that is not true; a false idea.” But who’s to decide what is true? Being tagged as delusional carries a negative, unpleasant connotation – calling to mind straight jackets, or maybe some scenes from “One Flew Over the Cuckoo’s Nest.” But thanks to our powers of perception – and Drs. Bob Duke and Art Markman – you can choose to change your definition of delusion. When you get down to it, much of human existence is delusional. We use our imaginations to fill in meaning, value, expectations and definitions around a small sliver of what we can actually observe in our surroundings. Our mental state – essentially our level of happiness or unhappiness – is based on how we choose to define and perceive our circumstances. For many of us, Thanksgiving means spending time with our families, carrying out traditions that we’ve practiced for years. While it can be very stressful, messy, and challenging to spend time with family members you don’t see very often, it can also be a beautiful time of recentering. Traditions serve a psychological function. By repeating the same traditional activity with the same group of people over the years, we construct a chronological record of who we’ve been before – and who we are now. It’s a hidden way of staying in touch with the consistent elements of our identities, and it allows us to track ourselves as we develop and change. Popular as they are, those words really aren’t as accurate as we would like them to be. Words are a part of almost every aspect of our lives, and the words we use impact not only those we are speaking to, but the very way we see the world – and even the chemicals released in our brain. Even though competing sports teams who consider themselves rivals like to highlight their supposedly apparent differences – in actuality, rivals are more alike than they are different. They share a common goal, for which they are competing. Rivalries allow us as humans to have a friendly competition. They can be energizing, and allow us to bond with our communities over success or failure. We may think we’re making conscious decisions about everything we do on a daily basis – but a large portion of things we do during each day, we do without thinking about them. Take turning on a light, or consuming snacks in front of the TV. These automatic behaviors are great because they allow our brains to consider more complex ideas and thoughts. They’re great, that is, until we are doing things automatically that are harmful to others or ourselves. The word failure arouses emotional responses that we’d usually rather avoid. What about the word success The thought of success arouses images of comfort, ease and satisfaction. Why? It’s because of something in our brains. We’re wired with a dopamine reward system that releases positive or negative chemical affect in our brains depending upon the success or failure of our efforts. Success feels good, while failure feels bad. So we tend to seek success and avoid failure. It’s simple. But hang on a minute and let the Two Guys on Your Head, Dr. Art Markman and Dr. Bob Duke, tell you about a function of failure that is too often overlooked and discredited: Failure is a learning tool. So how do we define Locus of Control? Essentially, it’s our positioning of ourselves within our perception of the world and the way that we perceive our power and influence. We can either feel in control of our lives – which is reassuring – or we can feel subjected to forces outside of our control – which we are then forced to endure. When that happens, we can feel stuck. Learning an instrument, especially as adults, provides us with a type of "brain food" that can help to protect our brains against damage. Experiencing music together is also an important part of being human. We like to be in sync. Experiencing live music with others, whether you're playing an instrument or not, provides a certain synchronized relationship that boosts our feelings of togetherness and enjoyment. Don Draper from Mad Men may have been unaware of the neuropsychological reasons that he intuitively constructed advertisements the way he did, or he may not have cared, but there are reasons. Have you ever found yourself in a shopping isle at the grocery store, mindlessly putting products into your cart? Why do you prefer one brand over another? Why does one item seem to just call out your name? Effective advertising might be the reason. Do you take pride in your ability to divide your focus and energy into more than one task at a time? Do you think you’re a good multitasker? Chances are, you’re probably not. We need to sleep for a host of reasons, but what exactly is happening in our brains while we’re unconscious? We've only scratched the surface of understanding all that happens during sleep, but we do know that while our bodies are resting, our brains are very busy.